Our company’s entry on the Insurance Directories web site is now live and includes a downloadable tri-fold brochure. We have a new method for the determination of water in various materials. It is based on the Dean and Stark method and uses a mixture of Toluene and mixture of Xylenes to carry the water over into a graduated receiver vessel where the water appears as a layer below the lighter solvent. Hint: hover over the following images for zoom in and move around. Recovery testing using known % of water. 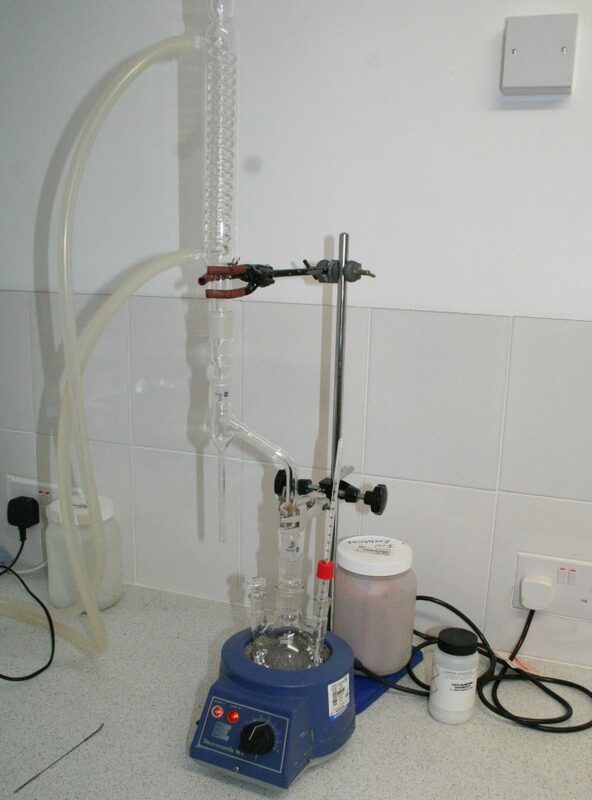 The sample (last image) shows the collected water as lower phase after about 3 hours of distillation. In this case, a very small drop of methylene blue was added to the receiver afterwards to aid the visualisation. The technique is quite tricky to get right and requires some practise. In order to get a good recovery a long wire can be inserted from the top of the condenser and by twisting the wire against the droplets the water they are encouraged to coalesce and drop to the bottom of the receiver to join the rest of the water. This is illustrated by the tiny remaining traces of blue still on the sides of the receiver in this case. 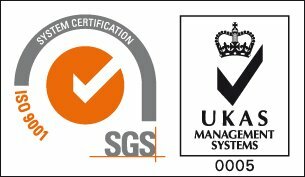 We are very pleased to announce that SMS Analytical Ltd has just completed the transition to the latest ISO 9001 standard (ISO9001:2015) following another successful audit by SGS, our accredited certification body. Our new certificate is available for inspection by clicking on the SGS Certificate logo at the top right of our website: www.smsanalytical.com. Christmas 2017- Big Thanks To Our Customers! helping to make our business thrive in 2017. Being a small company we really appreciate the loyalty shown by you guys. Exciting news for Christmas: SMS now have a High Performance Liquid Chromatography (HPLC) system to complement the existing range of other chromatographic techniques that we offer our customers. 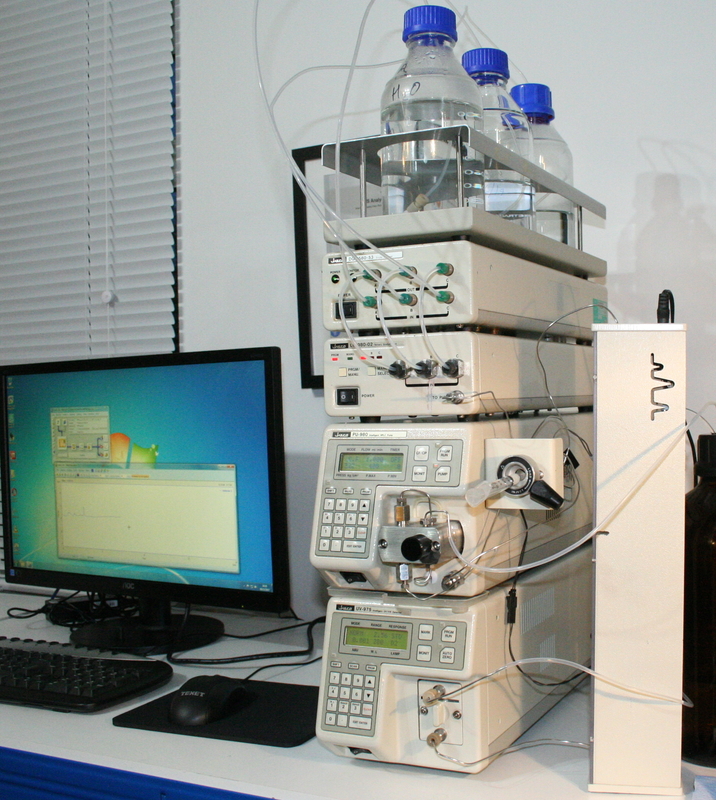 The HPLC system comprises Pump with ternary solvent input, solvent de-gasser, UV detector, column oven and data system. Future expansion options might include a Fluorescence detector. 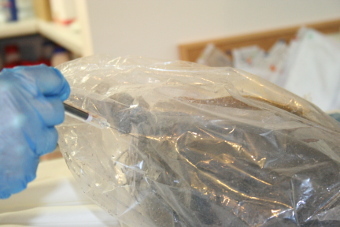 Nylon bags are frequently used in fire investigations to preserve samples such as fire debris for later analysis. They are considered to have very good resistance to vapour loss . However, this does not mean that they hold onto all vapours forever, and this could make the difference between detecting accelerants or not, or mis-identifying the type of accelerant. We showed in an earlier blog the type of profile seen for petrol (gasoline) vapours. 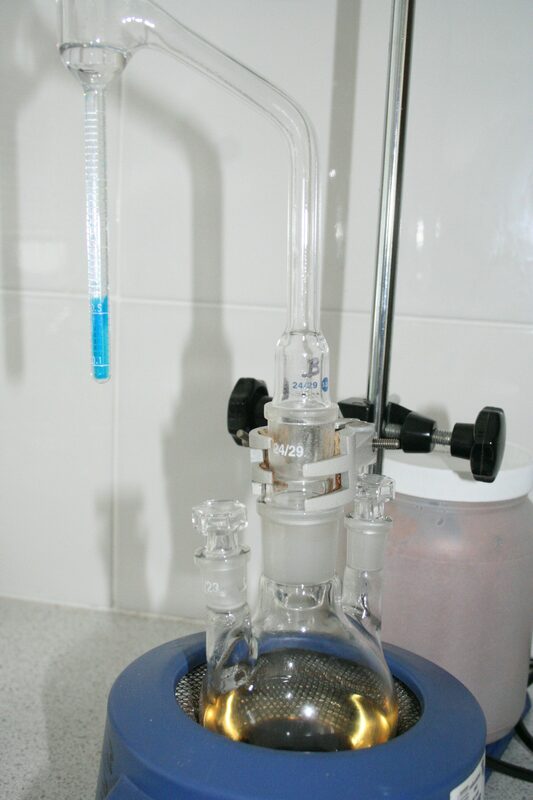 Petrol and volatile solvents, such as naphthas are the most vulnerable to vapour loss because the molecules are very small and can diffuse through the polymer into the air. We used bags from 2 different suppliers, adding 1µl of a synthetic mix of hydrocarbons in the gasoline boiling range to dry cellulose fabric, sealing the bag with a ‘swan-neck’ cable tie closure and encasing the bag with a second bag, also sealed with a swan-neck closure. The bags were then stored at ambient temperatures and the atmosphere inside each inner and outer bag tested after 20 days. We used a synthetic mix in order to see if particular types of hydrocarbons migrated through preferentially. 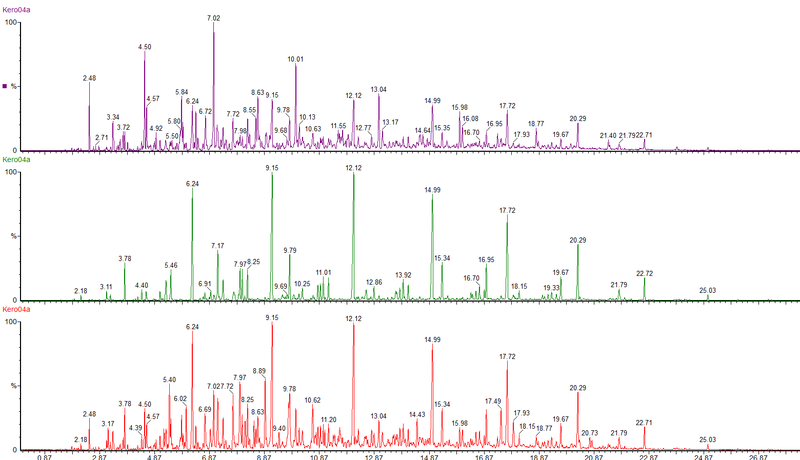 This is the headspace GC-MS chromatogram of the synthetic mix (red chromatogram), showing C0-C3 aromatics (benzene through to trimethylbenzene) in the green chromatogram, alkanes from C5 pentane to C12 dodecane (purple chromatogram) and cycloalkanes and alkenes (C5 to C8) in the black chromatogram. The total aromatics content of the mix was 34%, similar to petrol. 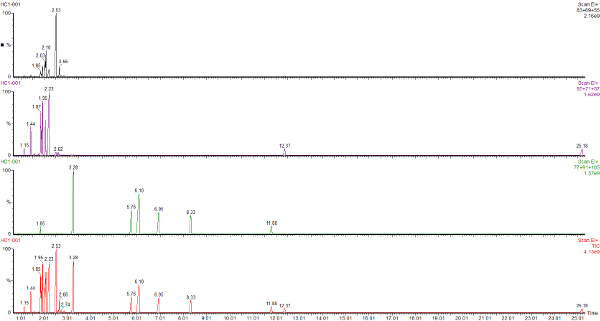 Here are the chromatograms of the vapour from the inner and outer bags after 20 days ambient storage. The red chromatogram is vapour from the Inner bag and the green chromatogram is for vapour sampled from the Outer bag. After 20 days the levels of vapour in the inner bags were significantly lower than the vapour concentrations immediately after sealing the bags. The concentration of vapour in the outer bags was lower than for the inner bags and there appears to be a preferential loss of aromatic hydrocarbons. This could affect the interpretation of the analysis as the presence of the C1 and C2-benzenes in particular helps to define whether petrol (gasoline) is present or not. In both the types of nylon bags used, volatile hydrocarbons permeated or diffused through to the outer bag, and onwards to the atmosphere from the outer bag. But is this because of the inefficiency of the swan-neck closure, allowing volatiles to escape from the bag, or are the hydrocarbons permeating through the polymer bag itself ? . We will be examining this in our next blog on this subject. To summarise, it is best if analysis of fire debris for accelerants is carried out as soon after sample collection as possible. Contact SMS Analytical to discuss our rapid accelerant testing service. Strijnik and Hong-You: Evaluation of the Effectiveness of Nylon Bags as Packaging for Fire Debris, 2004, Proceedings of 56th Annual Meeting of the American Academy of Forensic Sciences. In this article we show how we examine Kerosene and Diesel fuel using GCMS. Here is a typical chromatogram of a kerosene using a Mass Spectrometer as the detector. The number and distribution of the peaks forms a fingerprint of the fuel. 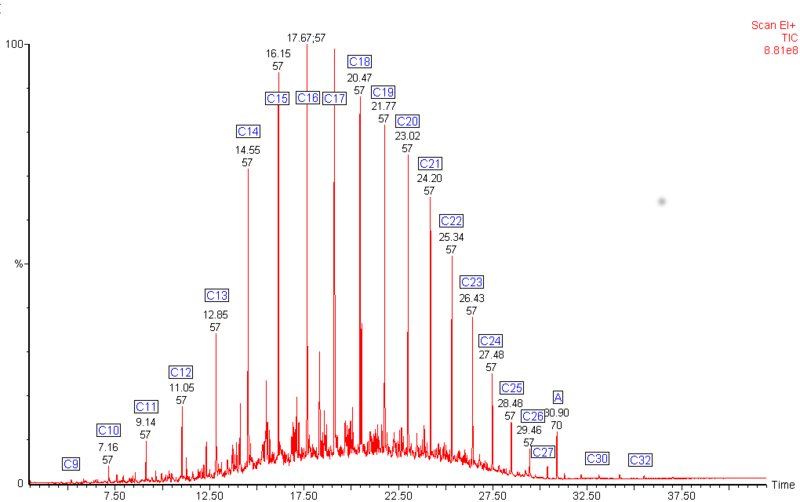 The chromatogram shows all the major peaks showing that this kerosene has an alkane range from heptane (C7) to hexadecane (C16). Kerosene contains different types of hydrocarbons: alkanes (or paraffins), cycloalkanes (also called naphthenes) and aromatics. We can use selective ion monitoring to separate out these different classes of compounds. The red chromatogram shows the whole range of compounds in the kerosene. 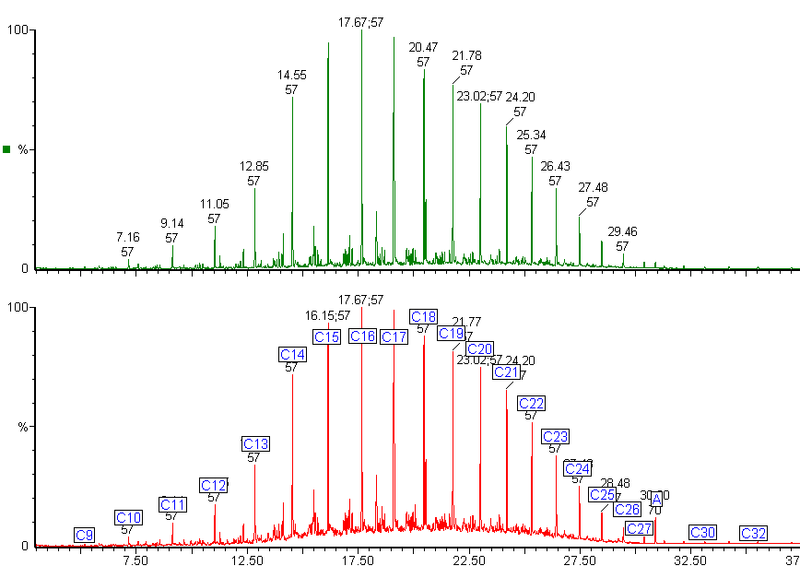 By using selected ions we can see the straight chain and branched chain alkanes (green chromatogram) and the profile of the cycloalkanes (purple chromatogram). The green chromatogram shows the alkylbenzenes present in the kerosene, ranging from toluene to C6 alkyl benzenes. Diesel fuel shows a mixture of hydrocarbons with a wider boiling range. The alkanes in this diesel fuel range from nonane (C9) to dotriacontane (C32). 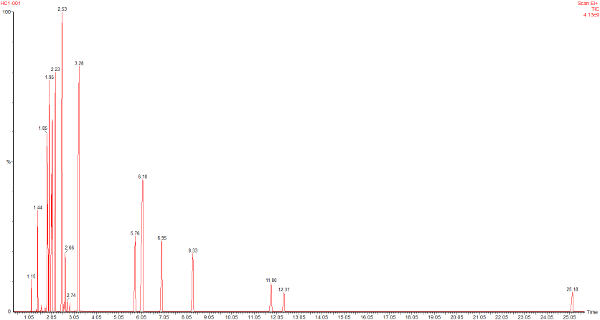 The chromatogram shows an unexpected peak (labelled A). The mass spectrum from this peak identified it as di-octyl phthalate, a common plasticiser often found in plastic containers. 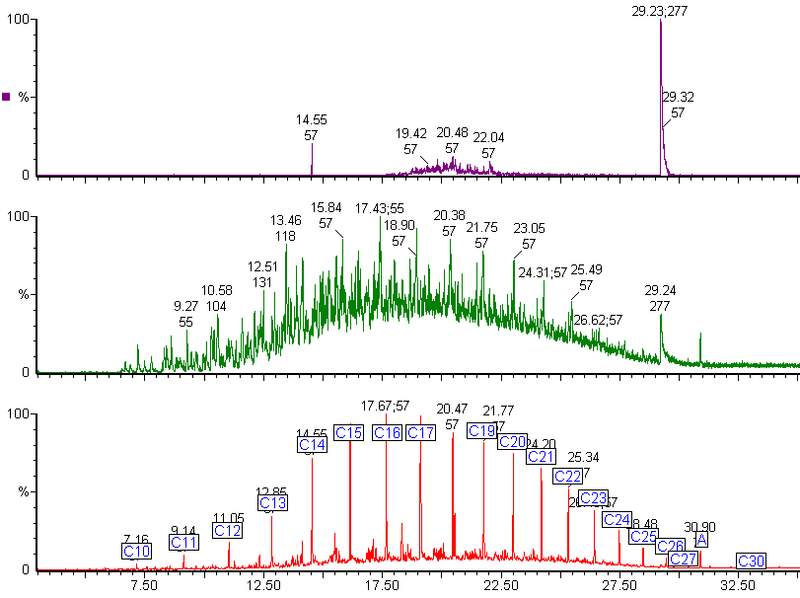 The green chromatogram shows the alkane distribution in the diesel fuel. 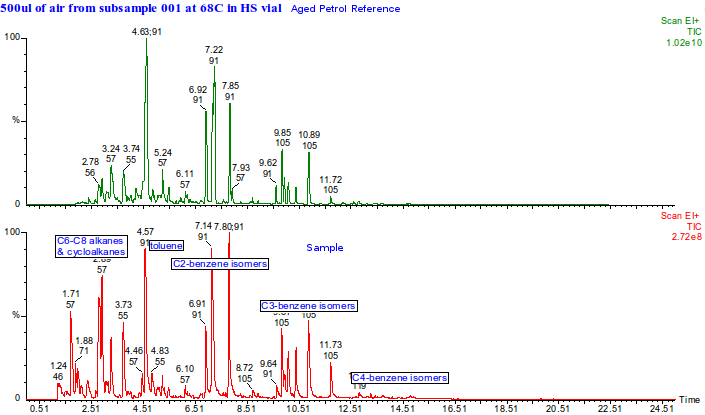 Sometimes contaminants are not seen in the main chromatogram because the hydrocarbons overlap the contaminant peak. Selective ion monitoring can reveal contaminants. 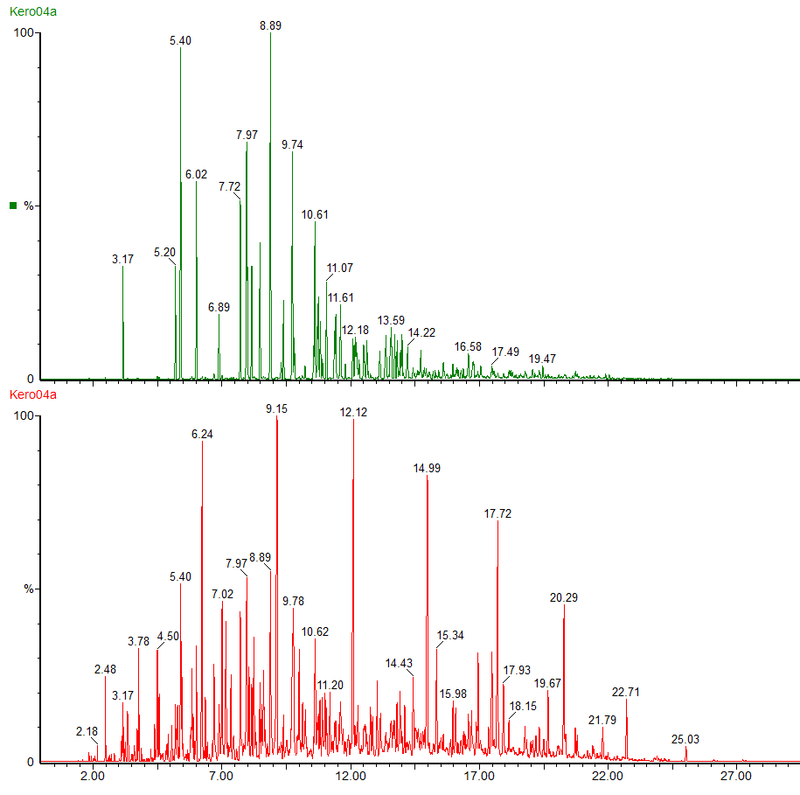 The green chromatogram shows the selected ion chromatogram for alkyl benzenes. The peak at 29.24 min is unusual and indicates a possible contaminant. By checking the mass spectrum of this peak against the NIST mass spectral library, we found a match with triphenylphosphine oxide, which is not a normal component of diesel fuel. The purple chromatogram shows the same peak is present in the chromatogram produced for the two main fragment ions for triphenylphosphine oxide. Accelerants may be used to start fires and SMS Analytical get a lot cases from insurance investigators relating to suspected arson using accelerants such as petrol. Debris from the scene is placed in nylon bags and tied using the recommended swan neck technique  before placing in an additional outer nylon bag. The contents of the syringe are injected directly into a GCMS for detection of relevant molecular ions. The figure below shows a vapour sample from fire debris (bottom) compared with a sample of vapour from an aged petrol (top). The identity of the compounds was confirmed using both mass spectral library  matches and reference compounds injected separately. Toluene, xylenes (C2-benzenes) and C3 and C4-benzenes are prominent in the fire debris vapour. The alkanes are, as expected, mainly branched chain or cyclic. The presence of petrol, a known accelerant, at the site of the fire was established. Find out more about our consultancy and laboratory services and an obligation free quote. Why use SMS Analytical ? Quick to grasp the details of problem that is being solved. With experience in a wide range of chemical ‘areas’ we are able to suggest analyses outside of the typical international and national standards or aternative techniques to overcome matrix interferences. Attention to detail and methodology is key to being an analytical scientist. In this respect we have been refining our operations and have brought in changes as the result of obtaining our ISO9001 certification in 2016. All quotations and reporting is peer reviewed before sending to our customers and we seek to obtain feedback once the report has been read. Proportionate use of analysis techniques which may be changed as the results from previous techniques are made. This means we would normally phone and email our client to discuss the preliminary results from the first analysis especially as it could be that we would advise not wasting time and money by analysing further using the techniques previously agreed in the quote. Instead, we may suggest alternative and more appropriate techniques, based on what we’ve discovered so far, or even recommend a stop at that point. As a guideline, we normally would expect to deliver the customer’s report in about 10 working days, depending on the nature of the work and the techniques involved. For non routine analysis, this is a very competitive situation compared to many of the big laboratories out there. Being a small company we are unhindered by layers of administration or red-tape and so can respond in a timely manner to customer queries such as pre quotation questions or post reporting questions.